It took nine hours of driving to reach this chain of unhappy camels sat in the thick yellow light of the late afternoon. Ours was one of the many long-wheelbase white tourist Transit vans climbing through the winding roads of the High Atlas. We stopped, along with the others, at the bends with the most spectacular views and were sold packets of dates and dyed geodes by small groups of souvenir sellers who waited at even the most remote curves. The High Atlas were orange with collections of dark green shrubs that thinned with altitude. 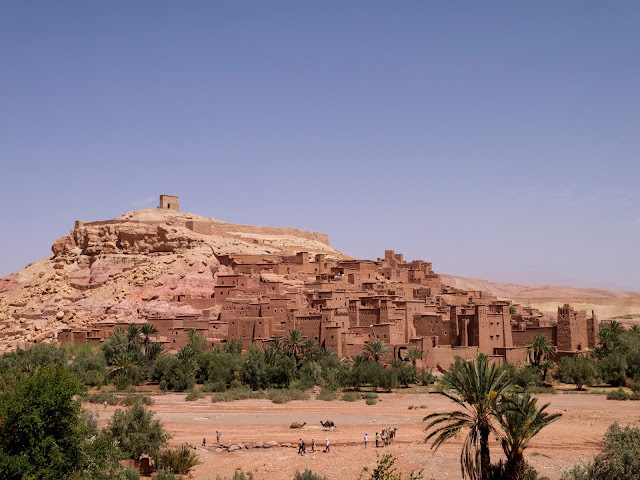 We stopped on the other side in the Dades Valley to visit the old fortified city of Aït Benhaddou, whose tight collection of mud brick castle-like square houses climb a small hillside overlooking a dry riverbed. We walked through the streets, keeping to the shadows to avoid burning in the noon-day sun, a white heat on the skin that made the sun feel within arm’s reach. The bricks are crumbling and parts of the town look like they’re melting back into the ground. A guide told us that the first meter of each wall is a stone foundation, but above that they are made from mud bricks that last only two years before the sporadic rains wash them away. The whole town is constantly being re-built and most people have moved to the new town across the river, leaving only four families to live in the miniature city. Aït Benhaddou is a ruin being constantly re-built. The outline and form not preserved in ancient half-forgotten stones, but in ancient, half-forgotten memories, continuously being refreshed in brown earth. After the Dades Valley we climbed into the strange alien stone landscape of the Anti-Atlas. The rocks were a deep iron red, and broken into discrete layers, as if made of bricks. There were no smooth lines, just Lego approximations of mountains and valleys, the road the most organic and smooth element, twisting through the valleys without any right-angles of its own to blend in with. The last stretch to Zagora took us up the Drâa Valley; date palm plantations hugging the river tightly, with raked regular irrigation channels cut into the hard earth between the palm trunks. 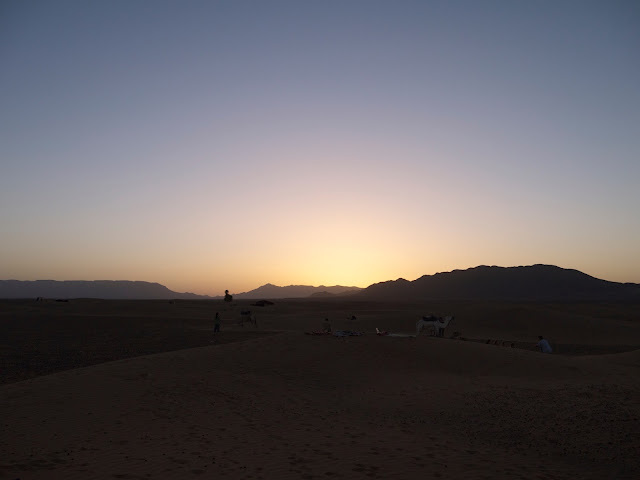 Our driver was getting nervous which gave him a heavy foot, he didn’t want to get us to the camels too late, we should arrive at the camp where we could play Bedouins before nightfall. Now we twelve tourists stand in front of the camels, eyeing them nervously, trying to see which of them looks the most sympathetic and least likely to bite. The camels look bored and unhappy, their handlers just look bored. The group of Belgian girls in our party chatter quietly and nervously. The group of London landscape gardeners trade banter back and forth. One by one we’re assigned a mount and climb onto the blanket wrapped steel frame that sits over the hump, a simple T-bar handle sticking out of the front. I grip the T-bar tightly as the camel seesaws frighteningly high into the air. That and the heat are enough to cause the steel bar to already be slick with sweat from the palms of my hands, offering no grip and now smelling of hot metal. Slowly the line of camels sets off, the blue polythene rope bridle of one camel tied to the saddle of the camel in front. The neck of my camel is raw, with weeping sores, where the line has dug through the fur and into the flesh. It soon becomes clear why camels are considered the most uncomfortable form of transport ever discovered. Without stirrups all your weight is on your bottom, the pressure quickly cuts off the circulation, and feelings, to your dangling legs. The rocking then rubs your backside raw almost instantly. Without some other way of taking your weight there’s no escape from the friction. After ten minutes I can see all the other riders carefully shifting, trying and failing to find some way of making it more comfortable. Tellingly the handlers are all walking. Ahead there’s a cry, then a few more shouts and screams; one of camels bucks and shakes, throwing its rider, Bob, off. He falls forward, catches the bridle for a second, then lands on his back on a berm and rolls away, the camel stamps on the ground and twitches from side to side. Bob gets to his feet and staggers away a few steps, a couple of handlers rush up shouting, grabbing at the lines and pulling the camel down. Other camels in the line start being skittish, letting out angry growls and bellows in answer to their fighting colleague. Panic spreads through the line, my camel steps nervously from side to side and makes angry sounds, but stays relatively calm. I grip the T-bar harder, but it’s already slick with sweat, forcing the worn metal smell further into the pores of my palms. Animals further up the line try and pull away, their tail lines pulling on the bridles of the camels behind them. Steve, one of the other gardeners starts having a panic attack, yelling at the handlers to let him down. A Polish tourist also starts yelling that he wants to get off. The camels are now in a jumble, milling about pulling each other with their connected lines. The handlers rush between the camels, pulling those down whose riders want to get off, pulling the others back into a line, soothing a few. Slowly calm returns, but everyone is nervously milling around on their camels. Bob appears fine after his fall, his iPad having taken most of the impact. Steve is sitting down breathing heavily, shaking and asking for a cigarette. The Polish man is shouting at the guides, demanding his money back and that he’ll report them to the Polish consulate, then arguing his fiancée off her camel as he doesn't want her riding one of the unreliable creatures. Soon there's agreement on who stays on, and who wants to walk. My camel seems to have remained calm, so I elect to stay on. Also because my legs are now so numb I don't think I could walk if I wanted to, even if the sore remains of my bottom insist that I should try. The sun is starting to drop in the clear sky as we leave the date palms behind, cross a bridge over a dry river and head into some small sand dunes. While the tour advertised camping in the Sahara, we’re not in the wide open expanse of the desert proper; instead the last barrier of sharp rocky hills surrounds us, but just beyond them starts the vast sandy heart of northern Africa. Not long after the low dunes start the sun vanishes and the world goes a deep blue. In the distance we see a single white light and are led towards it. As we rock slowly, painfully, closer to the light it turns into a circular encampment of big green ex-army tents. I try not to imagine what it would look like from the grainy overhead footage of a spy drone. Outside the ring of tents the camels are made to kneel down and we remaining riders delicately get off, trying to massage blood and life back into our legs. We then walk slowly and bow-legged towards the carpets laid out at the centre of the tent circle. At one end sits the dining tent, out of which comes a yellow light, dimly illuminating the large carpets laid on the sand in front. We sit down, gently, and happily take some mint tea offered by the guides. An earlier group of arrivals is already eating in the meal tent, so I wander out past the ring of tents, lie in the warm sand, dry yet fluid between my fingers, and stare up at the dark sky. Without any nearby lights the stars are incredibly clear. Later the moon will rise, giving everything silver edge and washing out most of the stars, but until then I can see them clearer than ever before. Once or twice a small streak of a meteorite blinks across the sky so quickly I’m not sure if I actually saw it. Dinner is a huge shared plate of tajine, which we eat while sat around a large low table in the biggest tent. Afterwards we sit outside again on the carpets and watch a two of the guides sitting around a fire and playing drums in long overlapping patterns. I can’t judge it these are authentic drum rhythms, or ones stolen more recently from the radio, but in this time and place they seem to fit.